Ever wonder if it is worth it to purchase the more expensive brand of the pink stuff? I wonder this every year! I typically buy 5-7 gallons (just to make sure I get it everywhere). Why do I buy so much you ask? I have always had trouble draining my water heater. It has a strange drain valve. I am never sure if it is fully drained. I am also not sure if there is a bypass built in. There is a mess of old copper plumbing behind the access panel to the rear of the water heater. I did buy replacement plastic plugs but for various reasons, I have not replaced the drain plug. As a result, I have just drained as much water as I could, blown out the lines, and dumped in several gallons of the pink stuff from Walmart. This year, I have decided to run a test of my own to see if there is any value in paying more for the brand as opposed to the Walmart house brand. 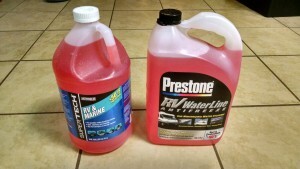 My test involves the SuperTech brand from Walmart against the Prestone RV Waterline Antifreeze. The Walmart brand was $2.89 per gallon versus $3.98 for the Prestone. The cost difference was $1.11 per gallon. 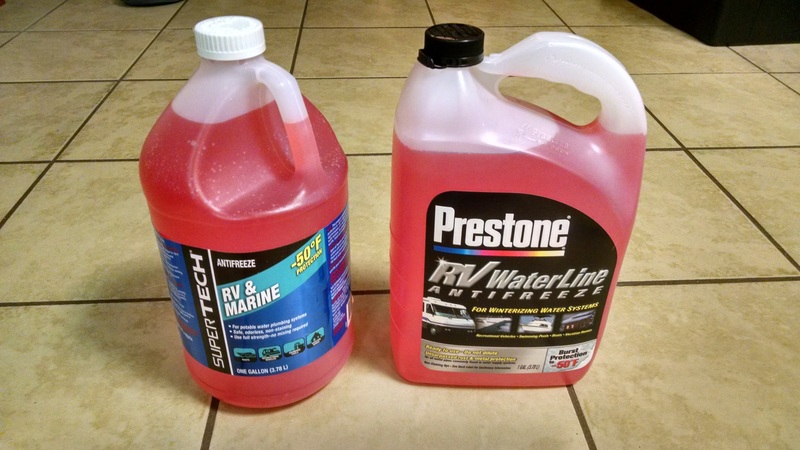 My moral dilemma is do I be a cheap penny pincher to save just over $6.00 and potentially put my precious RV at risk or am I wasting $6.00 when the store brand would work fine? I bought one gallon of each brand. 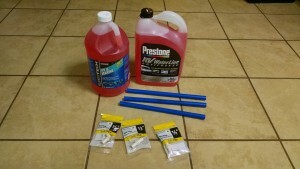 I actually had some extra PEX tubing aroun d so I bought some plugs to make some test pipes. I loaded the first pipe with water (as a control) and marked it with a “W”. I marked the second pipe with a “I” and marked the SuperTech brand with the same single mark. The last pipe has the Prestone brand and it is marked “II”. My test pipes are ready and now I just needed it to get cold. Here are the finished test pipes. 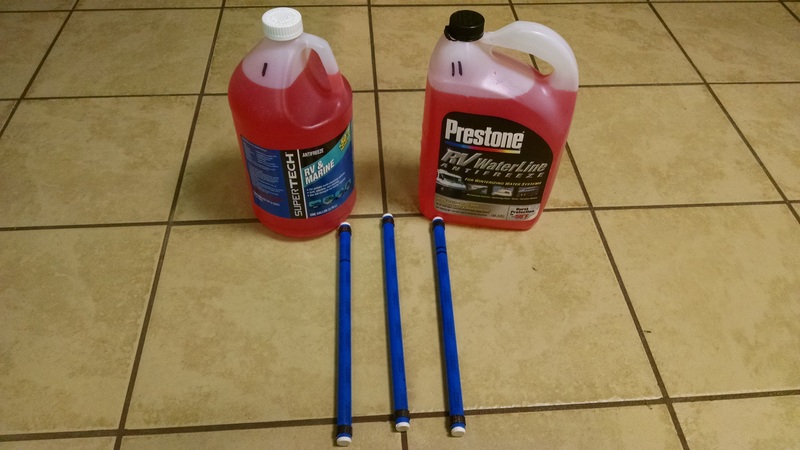 For what it is worth, I did drain the water out of my Argosy, poured in 5 gallons of the SuperTech, and ran the lines until it came out pink. Every good experiment needs a hypothesis. I am expecting the pipe with the pure water to freeze, expand, and show signs of stress or flat out split. 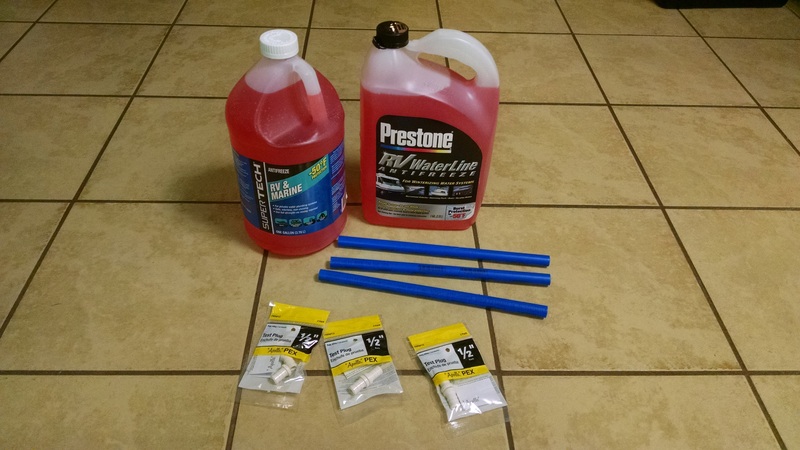 My hunch is that both the SuperTech and the Prestone antifreeze will in fact protect the pipes. There should be little to no expansion and no stress on the pipes. The test pipe is new PEX and all three test subjects were cut from the same single pipe. As of today, the experiment has begun. the pipes are all resting against the hubcap outside. 1/4/2016 – The temperature dropped to 31 degree and we had light snow. No signs of stress or expansion in the pipes. 1/5/2016 – It was 17 degrees this morning. There are still no signs of expansion or stress on the pipe. I have to say I am impressed with the pipe since the water must be frozen inside the pipe with water. Update 1/11/2016 – It was 17 degrees again this morning. The water pipe appears frozen. There is no sound when shaken. Pipes I and II have a slight swish to them so they don’t appear to be frozen solid. None of the pipes show any sign of strain. 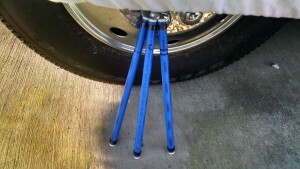 It is new PEX tubing with the Sharkbite brand from Home Depot. I am also wondering if I should have included a 90 degree fitting since that might have a higher likelihood of bursting. A perfect test would be a “U” shape to test both plastic and brass 90′ elbow fittings. Update 1/13/2016 – It was 14 degrees this morning. The pipe with water is frozen solid and swelling. No cracks. Pipes I and II with the pink stuff are still fluid and are not swollen. Update 1/18/2016 – It was 11 degrees this morning. Very cold! Pretty much the same update from 1/18/2016. The pipe with water is frozen solid and swelling. No cracks. Pipes I and II with the pink stuff are still fluid and are not swollen.I have a strong hunch that a 90 degree elbow with water would have split. I think the only reason the pipe with water has not split it the fact that (1) it is straight and (2) it is new PEX pipe. 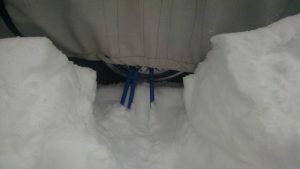 Here is a picture from the day we had 18 inches of snow. The water pipe was frozen while the two versions of anti-freeze were both in liquid form.